We might consider this a bit of lighthearted weekend humor, but unfortunately it's all too real and all too lame, especially considering significant funding and resources actually went into this. And given that it's NATO, somebody's tax dollars had to actually foot the bill. But even NBC's write-up of the story comes close to making fun of NATO's latest attempt to combat fake news in pointing out that "reaction... appears to muted". YouTube screengrab from the NATO-created online game "The News Hero"
Players have to decide whether the headlines that pass their virtual 'desk' are real or fake. 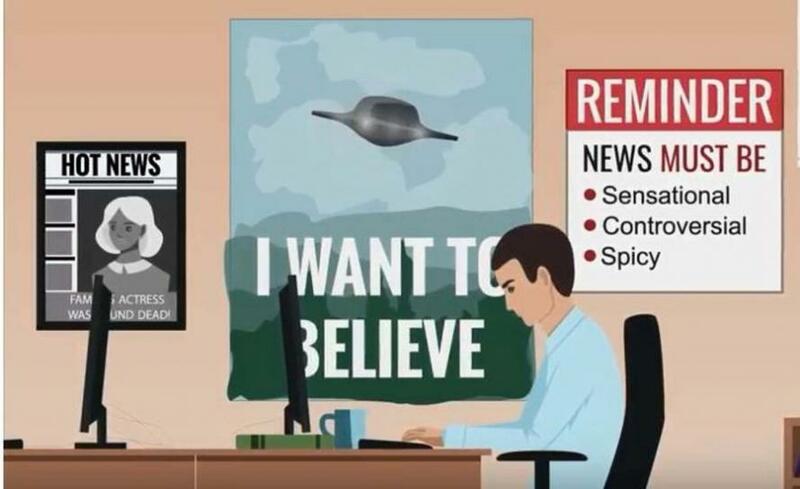 The game's creator's say they're seeking to educate the Western public on how to properly discern real news from fake news or worse, Russian state disinformation campaigns. The News Hero was developed over a period of four months by a team of eight people at the NATO Strategic Communications Center of Excellence in Latvia, which bills itself as "focused on countering misinformation campaigns" (yes, the name of this NATO unit is real). NBC's report noted the developers were not forthcoming with just how much money was spent on the project. As Stars and Stripes explains, "the user is responsible for putting together a newspaper free of the phony. With the help of trusty assistant Bronco, you decide what is real and what is fake." Or rather, you decide what NATO wants you to identify as fake, or real, or disinfo, or untrustworthy as a source. The NATO-created "News Hero" Facebook game launched a week ago. Though the online game launched last Monday — a full week ago — it now has... wait for it... a whopping 3 shares and 123 'likes' as of late in the day Sunday. So it appears people aren't even so much as making the effort to share it out of mockery, much less actually playing and promoting the game. To get your company noticed and gain an audience, you must publish accurate news. Pay attention to the hints provided in the Fact Checker screen and verify the incoming stories. With each level becoming increasingly difficult you can hire new assistants and obtain things to customize your office. This will boost performance of your employees and help you earn more. The game is divided into three levels, each informing the player on how to distinguish between the fact and the fiction. Are you up for the challenge? Invite your friends and climb the leaderboard! In The News Hero, you have to decide — though a fact-checker does most of the thinking for you. If you’re right, you gain virtual currency and a larger audience as reader trust grows for your news organization. If only it were so easy in the perilous real news world, where profits are elusive and clickbait an ever-growing lure. One of the two reviews on the game's Facebook page sarcastically quips: OK. So this is the 'push back'. An 'A' for effort! It's interesting to recall that ahead of and during the NATO summit in Brussels earlier this month President Donald Trump made headlines for berating other NATO member states for not living up to a prior 2014 pledge for member states to reach two percent spending of GDP on defense by 2024. However, we doubt that the president had such further projects as The News Hero in mind when he called for more NATO defense spending. The online game is clearly a complete and utter flop.